Crumley is an extremely quick and powerful player. She can play in the post as well as outside on the wing. The shortage of posts on her club team forced her to play a taller position than she was. Despite being shorter than other posts, Crumley makes a huge difference in games by playing on the inside. 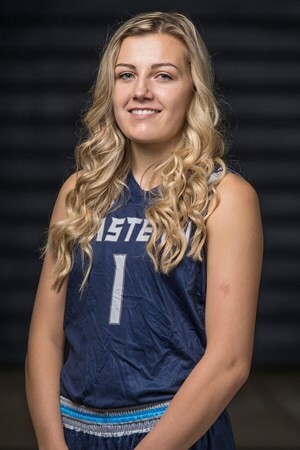 The daily motto she lives by is, “do your best and that’s all anyone can ask for.” She decided at a young age that she wanted to excel in basketball and play collegiately. She has stuck with her goal through the years. The one thing in Crumley’s life that she is most proud of is getting the opportunity to play college basketball. Crumley loves basketball because it is a team-based sport. “It feels like they’re a second family and I love going out on the court with my best friends.” If she wasn’t playing basketball, Crumley would be playing softball. If she could have any talent, she wishes she could sing better. Her favorite type of music is rap, and her favorite type of movies are comedies. Something that most people don’t know about Crumley, is that she can dance. Turquoise is her favorite color, and her favorite food is steak and shrimp. The biggest regret in Crumley’s life is spending too much money on desserts. Other activities Crumley enjoys is four-wheeling and fishing. Summer is Crumley’s favorite season. The biggest sacrifice she made is moving six hours away from home to go to school. The hardest thing she has adjusted to is making food for herself every meal. The most rebellious thing she has done is skydiving. Crumley claims that she has been blessed in that she hasn’t gone through any tough injuries. The two people that are the biggest influences in her life are her dad and her grandma. They came to every game and were a great support base for her. Her dad and her grandpa both played college football. Her dad played at Idaho State University, while her grandpa played at Brigham Young University. One of the worst dates Crumley’s has been on was when she went horse riding. One of the horses broke its leg and the owners had to put it down right in front of her. Crumley cried and went straight home. The most embarrassing moment of Crumley’s life was falling down at prom because she wasn’t used to walking in high heels. When most people meet Crumley, they think she is quiet until they get to know her better. She is a dedicated friend who loves to joke around with others.